Special Agents Douglas Flanigen Denney and James Stratigos were traveling in a government car on Highway 53, NE of Dawsonville, GA. As they drove along in the right traffic lane, they observed two cars (possibly drag racing) driving side by side and approaching them at a high rate of speed. 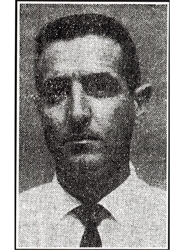 Before they could take evasive action, one of the two cars crashed head-on into the government car, instantly killing Agent Denney and seriously injuring Agent Stratigos. The passenger in the other car was also instantly killed while the driver died several days later. It was later determined that this driver had a local reputation for speeding, several arrests for reckless driving and his driver's license had been revoked. He was found to be carrying a fictitious driver's license. The third vehicle involved in this tragic incident did not stop and was not identified. Agent Denney joined the Alcohol and Tobacco Tax Division (ATTD) on November 21, 1955. In 1961, Agent Denney (along with other ATTD agents) received a commendation from Attorney General Robert Kennedy for his excellent law enforcement assistance during civil unrest in Montgomery, AL. He also received a commendation in 1958 for his "raw materials" investigation of a major liquor violator, which led to many arrests and seizures. Agent Denney was a U.S. Marine Corps veteran, having proudly served during World War II. Agent Denney was born in Athens, GA. He was survived by his wife, Lula and their two children; Linda and Douglas.